Responsive web design (often abbreviated to RWD) is a new way of building web sites whereby the site is crafted to provide the best possible user experience across a wide range of devices including desktops, laptops, tablets and smart phones. It has become really important because of the phenomenal rise in internet use on mobile devices. It is predicted that in the very near future the majority of internet browsing will be done on a smart phone or tablet. Before responsive web design came along there were two options available for dealing with the problem of viewing/using websites on different devices. Option one was to not worry about the mobile device using viewers and simply build website for a desktop sized monitor and rely on smaller devices to scale the site to make it usable. This means a website would look beautiful on a large desktop would look tiny and illegible on a smart phone, forcing the user to zoom in and out to navigate. The second option was to build separate websites for a specific devices. Now, with responsive web design, one design can be used across all devices. This has advantages in terms of flexibility and, most importantly, cost, as the development time is considerably less than creating multiple websites. 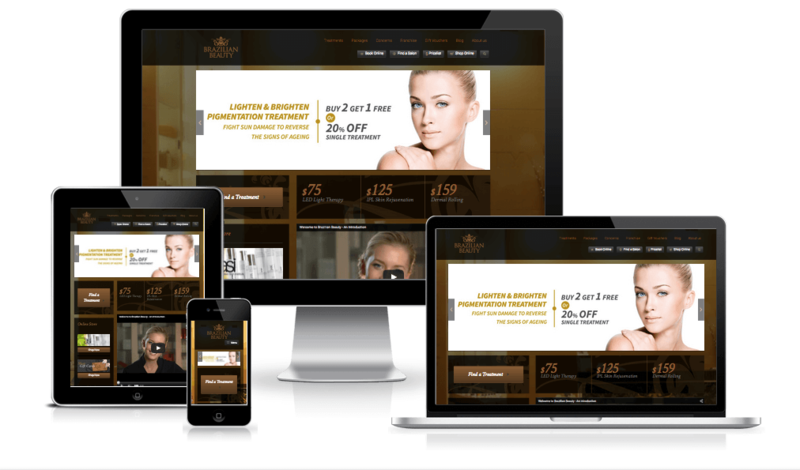 So what does a responsive website look like? Well take a look at any of the websites that we have created over last six months and you’ll see. BA Creative is committed to building sites the responsive way and we were one of the first web design firms in Australia to make this commitment. Rather embarrassingly our own website isn’t responsive, as it was built before the concept took the World Wide Web by storm, but we’re on to it and a new site is in the pipeline. To show you some specific examples I have included some images of the Brazilian Beauty website below which show how a site can be great looking on all devices. For more information on responsive website design and how you can get your website looking great whatever it is viewed on, get in touch.